Tom Hess Joins Rhapsody Of Fire! I'm very proud to announce that I've joined the epic film score metal band, Rhapsody Of Fire who has been the pioneering and leading band in the genre of music it created - selling more than 1.5 million records to date. Rhapsody of Fire signed their first record deal with LMP Records in 1997 and released the debut album "Legendary Tales". The albums to follow increasingly sold more and more copies and landed in the billboard charts of several countries world wide. The most recent release, “The Frozen Tears Of Angels” debuted also in US at #52 on the Billboard Heatseekers chart, #60 on the Top Hard Music Albums chart, and #132 on the Top Independent Albums chart. Other international chart entries are as follows: Greece #11; Italy #31; Germany #33; Finland #35; Switzerland #39; Japan #41; France #51; Austria #58; South Korea #69; Spain #81; and Belgium #96. 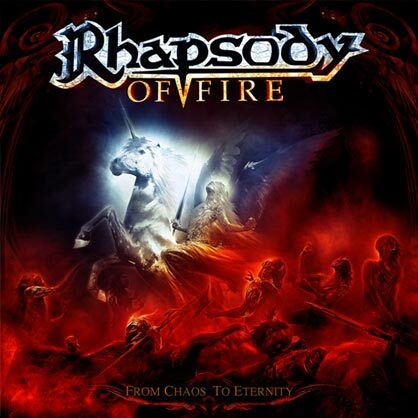 Rhapsody Of Fire also entered in the EUROPEAN BILLBOARD CHART at position 59! In 2005 and again in 2007 I had the opportunity to tour with Rhapsody of Fire on their European and North American tours (at the time I played guitar in the melodic metal band HolyHell). In January and February of 2011 (just days after joining the band), I immediately began recording many of the guitar parts for the new album (more on my recording experience below). The new album titled: "From Chaos To Eternity" is scheduled to be released June 17, 2011 (shortly afterwards in the US). Check out the album cover and song list below.